Ally Katte’s Guide to Montmartre (and a few other places in) Paris. While my trip to Paris was limited to just 4 days, and we didn’t stray South of the River for longer than a quick drink by Notre Dame, it is safe to say that if you were going to stay anywhere in Paris make it Montmartre. The home to the breathtaking Basilica Sacré Cœur, cabaret after cabaret and beautiful food as far as the eye can see. We rented a studio apartment, which while more expensive than a hotel room it meant that we saved loads of money not having to eat out every knight. And everything you’ve heard about the prices is right! 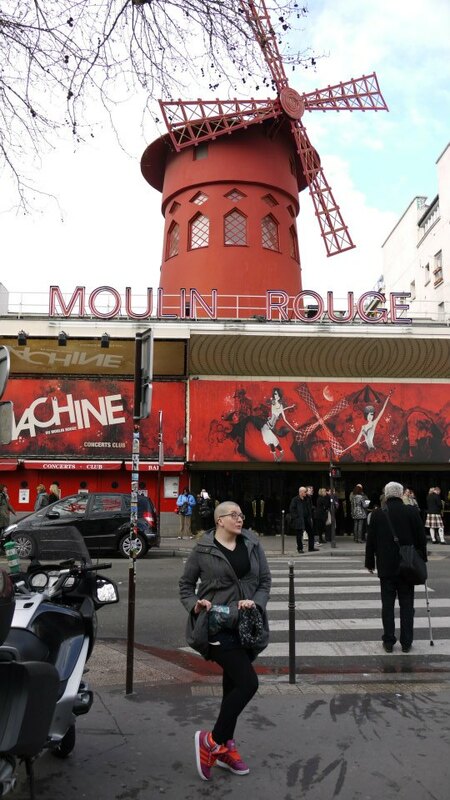 Montmartre is famously known as the home of the legendary Moulin Rouge. We didn’t go and take in a show. We had not really seen particularly good reviews as being worth the 100 odd euro per person, nor is the show anything like the burlesque I know and love. But I did take a picture…doing the can can with my coat in the middle of the street. 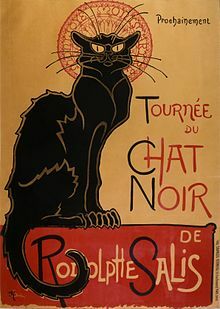 A thoroughly recommended place to go is The Museum of Montmartre If you plan on visiting before the end of June they have a wonderful exhibition on Le Chat Noir, the iconic cabaret. The museum was truly inspiring, it houses original posters from Le Chat Noir and Folies Bergere as well as photographs of artists such as Toulouse-Lautrec and Picasso. Montmartre is home to one of the great cemeteries of Paris, it is the final resting place of Vaslav Nijinsky of the Ballet Russes, writer Stendhal (the psychological Stendhal Syndrome was named after him, look It up! ), classical chef Marie-Antoine Carême, can-can dancer La Goulue, film maker François Truffaut and many many more authors, composers, dancers and artists. 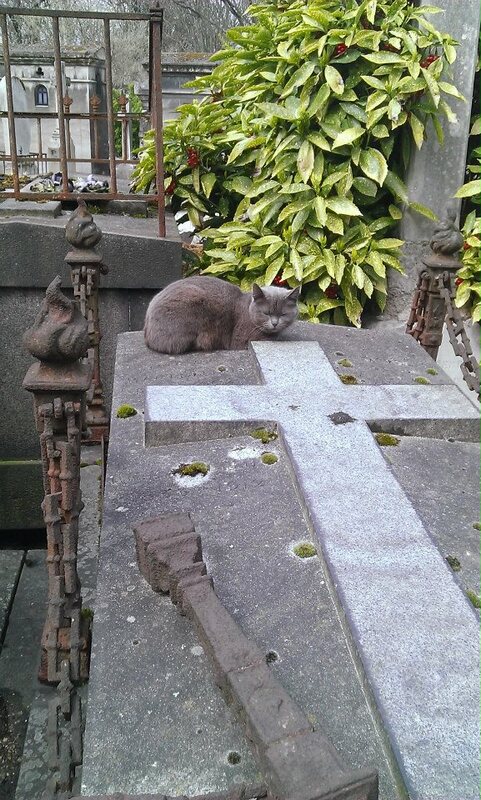 AND a whole host of cemetary cats who made the almost fruitless search for the grave of Ernest Renan a lot more bearable. And of course, the Basilica. It tops the hillside, surrounded by the beautiful winding streets and staircases. And once you’re placed on the huge steps in front of the Basilica you get the best view of Paris. With the gorgeous tightly packed streets of Montmartre in front of you, stretching out to the edges of the city and of course the Tour Eiffel. 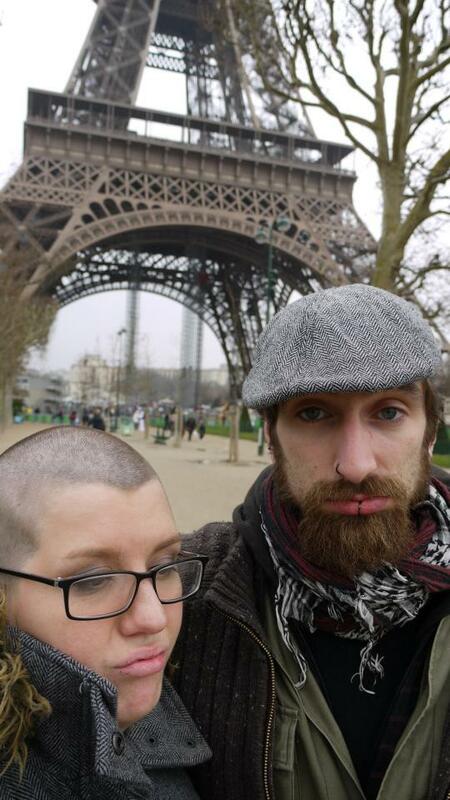 My husband and I chose to take a typically Parisian attitude toward it. We also went to the Catacombes and to the hilarious one man show, How to Become Parisian in One Hour. We ate at Cafe Bruant, Zebre au Montmartre, Coquelicot and Gontran Cherrier artisan boulinger. We popped into a gorgeous fetish and lingerie boutique named Phylea which doesn’t even have a website. Walking inside made me feel like I was being taken back in time to a 90’s euro camp heaven. Not so much Eurotrash as EuroCASH amirite?! And unfortunately we would not recommend the Paris CinemAquarium, at 20 Euro each it was absolutely NOT worth the money. Thanks for the timely post! This little monkey is arriving in Paris on Thursday morning for 7 nights. He does have tickets for the Moulin Rouge and yes we read the reviews and figured it was overpriced and over-hyped but what the hell, it is Paris and it is the Moulin Rouge. Staying in Vendome area on Rue de la Paix so we hope to walk to a lot of places and Montmarte is definitely on our list of outings. Thanks for the tips! Also, I did notice your jackets…I do hope the weather warms up later this week. Auvoir.